“Maya” is a VP of Client Success in a tech company. She was hired to drive change and results in the market for the product her company sells. She’s a fast, see-around-the-corner strategic thinker who is known for relationship building across the aisle. What Maya has implemented in her short time on board is the stuff of leadership legend. She’s analyzed the pain points, current capacity, and learning needs of her team. She outlined the vision, strategy, and tactics required to sync up with organizational and people goals. She’s highly emotional intelligent and drives the change she’s been hired to accomplish by adopting a coaching approach to leading her team. And, as any leader would, she often sets down her coaching hat and problem solves. Challenges. Directs. Asks for accountability. 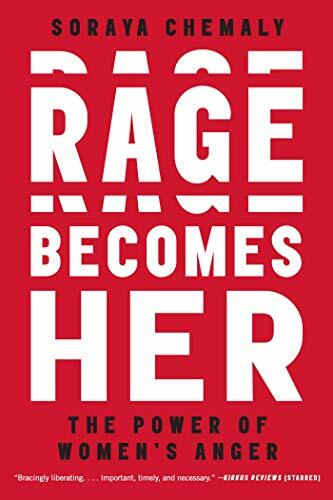 Before I tell you what Maya did in response, let’s talk about female “anger.” I’ve been reading Soraya Chemaly’s incredible book,Rage Becomes Her. This must-read is full of stories about the cultural requisite that women must suppress their anger to be accepted. Loved. Deemed feminine by the patriarchy. And how our feelings leak out sideways into passive aggression and other coping behaviors. My experience reading Chemaly’s book was very much like reading Women Don’t Ask, The High Cost of Avoiding Negotiation, still persistently relevant though it was published in 2007. At around page 30 in both books I thought I might be better off tossing them into the fireplace I don’t have I was so annoyed. (Angry.) But don’t worry, both books have prescriptives for action. Maya and I spent a good amount of time outgassing the effects of being angry about being told she was coming off angry. We made space for her full range of feeling. Once she felt heard and understood, she was able to identify where “perceptions of anger” might be accurate, and where cultural/gender bias needed to be transparently addressed so that the full range of “being female while leading” might be a sea change opportunity for her organization. Maya is lucky, I admit. She’s a VP with authority and the chops to pull off consistent bottom line results that perk the ears and hearts of her coworkers up and down the chain of influence. Her conversation was successful. No matter where you are in your organization’s hierarchy, you too CAN have conversations with managers and coworkers that seek to pull the covers off the cultural and institutional biases that keep us silent, suppressed, numb, and damned angry. Let yourself feel. You can, and you must. P.S. Here’s Brene Brown’s very different take on that conversation.